Well hello there ladies, welcome to today’s episode of Wild Woman Run Free! Today we are going to talk about a topic that inspires me to the depths of my soul. That’s a pretty big call huh? Well it’s true. And the topic today, is why I believe YOU should get inspired to start YOUR own business! Most of us have been brought up in a society where we had to go to school, get good grades and get a good job? Right? But you know what? You don’t have to do that! You do have a choice of doing what you love and having ultimate control of your life. So if you haven’t considered running your own business, all I can say is keep an opened mind and give it some thought! Or, if you’ve thought about running your own business, but don’t really know where to start? All I can say is, don’t give up and don’t think it’s too hard. 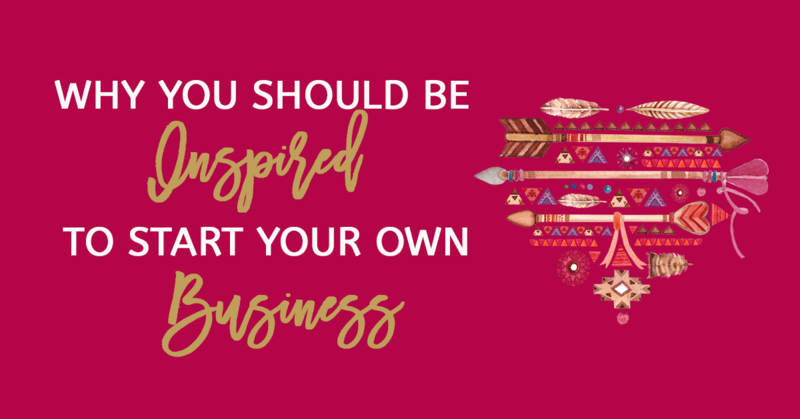 All you need to do is learn how to do it and before you know it, you’ll be on your way to starting and building a thriving business that you love! Ok, so what are the benefits of starting your own business? Well first of all, you get to sack your boss! Hey don’t get me wrong, you might have an amazing boss and they may really appreciate you! But, can you imagine how it would feel, if you never had to ask permission to do anything again? Let’s say you want to go travel around Italy for a few months, wouldn’t it be great, if you could just pack your bags and go, whenever you felt like it? Or hey, even if your family just want to get a way for the week. How awesome would it be to make the decision and not have to ask anyone for permission? Or even feel guilty for doing so? Owning your own business can give you that flexibility for sure. Because you own it, YOU’RE THE BOSS! That’s right and the only person you need to answer to IS YOU girlfriend! So if you want to build a life of freedom, look into starting your own business! Ok, another reason why it’s good to have your own business? Is TIME FREEDOM baby! When you’re the boss, you don’t have to work on someone else’s time. You can work anytime you want. You can schedule your work hours around your kids, or during the times when you feel most productive. You may want to work in the evenings, or better yet, you may only want to work 4 days a week if you want to. The beautiful thing about owning your own business, is that YOU determine your own hours! If you don’t want to work on your birthday? You don’t have to! If you don’t want to work because your kids want to go to the beach? You don’t have to either! You want start your day doing Yoga? You can do that too! You can’t get time freedom in a job, unless it’s part of the culture. Most of the time it’s not. So you want time freedom? Start a business! But where there’s a will, there’s always a way. RIGHT? You want to make money, while on a yacht off the coast of Jamaica? You can do that. You want to make money, while climbing the ruins of a Scottish castle? You can do that too. Another benefit to owning and running your own business. Imagine what kind of life you’ll have if you had a business that allows you this freedom? Talk about a life of adventure! Another great thing about owning your own business, is that you can choose to work with whomever you want to work with. If you want to work by yourself and call the shots? You can be a solopreneur. If you want to work with a team of people and bounce ideas off each other and leverage eachothers efforts? You can choose the team whom YOU want to work with! And what’s even better is, that YOU get to choose the clients who are right for you, by attracting the right clients. Imagine creating a business that you want to create! With the positive and supportive clients and customers that fit with your values? When you own your own business, you can surround yourself with the people that you choose to be in your life. Yet another benefit! And also, freedom to do what you love. That’s right ladies, the skies’ the limit with what you want to do and how you want to do it. Follow your passions, because when your heart is in your business, you will radiate with love and positivity and abundance will just flow effortlessly. Imagine spending your days doing what you love? And making an income from it? How many people do you know, who are doing something that they love, that they are passionate about? You only live once right, so why not???? Follow what lights you up and success will follow. And last but not least, I can go on forever, listing all the benefits of owning and building your own business. But today, we’ll settle for these …. The final benefit is….. drumroll please…. Uncapped income potential. That’s right, if you’re working for a boss, you’re income is capped each year. It’s all about the profits, so you will find that you’ll either be waiting for a payrise that doesn’t come or you’ll get a payrise, but it’s minimal. When you own your own business, your income is up to you baby! It’s all about working smarter and setting your business up for unlimited potential. So it’s up to you how much you want to make! And you know what’s even better? You can make money and spend that money making a difference in other people’s lives. So if you’ve ever wanted to do so philanthropic work, then here’s your opportunity to do so. All you need to do is start and own your own business. So, if this episode has inspired you to look into starting your own business, please share it with others who you think could benefit from this too. And stay tuned, Wild Woman! Because at the beginning of 2017, I will be launching a free workshop series to help you on your way to starting your own business! So stay tuned! For those of you who are still yet to join the Wild Woman Run Free community, sign up and get access to all tip, tricks and inspiration to help you on your wild woman journey. Remember that you can create any life that you want Wild Woman. Don’t be afraid to explore the road less travelled and remember, like Marie Forleo always says everything is figure-outable. Nothing is ever too hard and the answers are just a finger tip away. So if this is something you can see yourself doing, go for it girlfriend! You never know where this road will lead you. To our success and our Freedom. Live Wild, Live Free, Wild Woman Run Free baby!